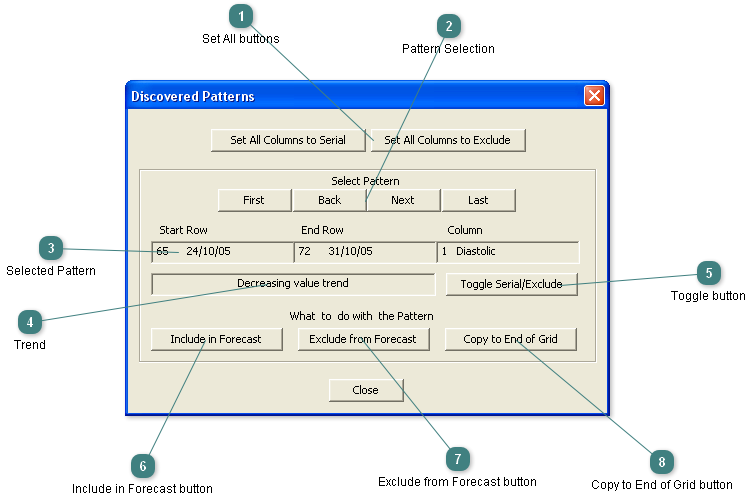 The Discovered Patterns dialog is produced after Action > Discover Patterns has run. The dialog will show any of the patterns that have been discovered in the grid and can be used to extend or modify the grid with the discoveries. All columns are checked for increasing or decreasing trends. Any such trends identify patterns. The mode of all the grid columns is set to Serial or Exclude. Press the buttons to find and select a discovered pattern. The grid start row, end row and column in the currently selected pattern. The trend of the values in the currently selected pattern. The serial mode of the selected column is inverted. The selected pattern will be included in any forecasts. Every pattern is included by default. The selected pattern will be excluded for all forecasts. The selected pattern is copied to the end of the grid.